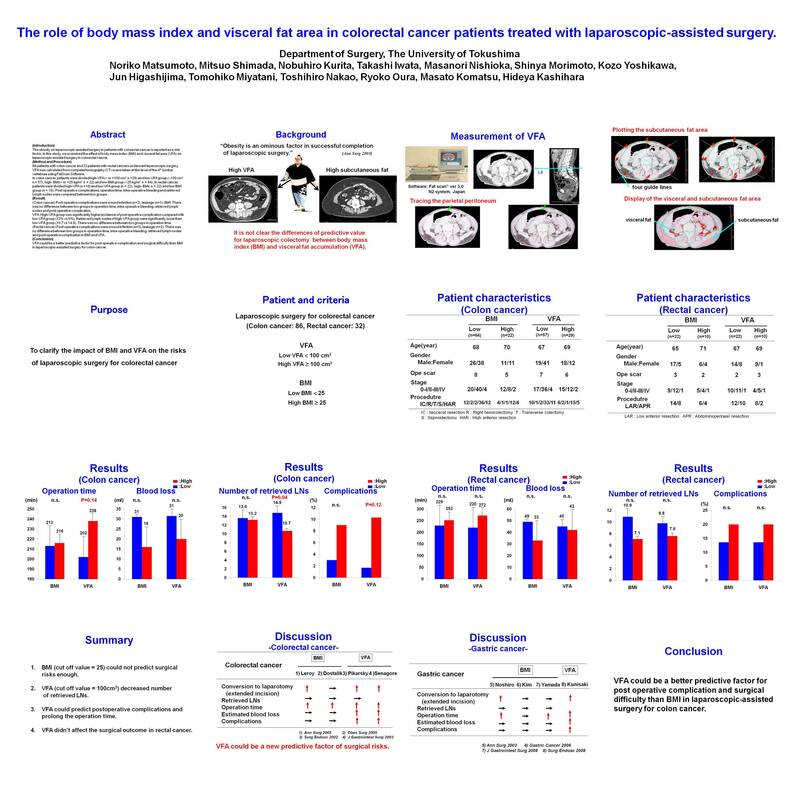 The Role of Body Mass Index and Visceral Fat Area in Colorectal Cancer Patients Treated with Laparoscopic-Assisted Surgery. The obesity on laparoscopic-assisted surgery in patients with colorectal cancer is reported as a risk factor. In this study, we examined the effect of body mass index (BMI) and visceral fat area (VFA) on laparoscopic-assisted surgery in colorectal cancer. 86 patients with colon cancer and 32 patients with rectal cancers underwent laparoscopic surgery. VFA was calculated from computed tomography (CT) scans taken at the level of the 4th lumbar vertebrae using FatScan Software. In colon cancer, patients were divided high-VFA (> or =100 cm2 n =29) and low-VFA group (<100 cm2 n = 57), high- BMI(> or =25 kg/m2 n = 22) and low-BMI group (<25 kg/m2 n = 64). In rectal cancer, patients were divided high-VFA (n =10) and low-VFA group (n = 22), high- BMI( n = 22) and low-BMI group (n = 10). Post operative complications, operation time, intra-operative bleeding and retrieved lymph nodes were compared between two groups. (Colon cancer) Post-operative complications were wound infection (n=2), leakage (n=1). BMI: There was no difference between two groups in operation time, intra-operative bleeding, retrieved lymph nodes and post-operative complication. VFA: High-VFA group was significantly higher incidence of post operative complication compared with low-VFA group (13% vs 0%), Retrieved lymph nodes of high-VFA group were significantly lower than low-VFA group (10.7 vs 14.8). There was no difference between two groups in operation time. (Rectal cancer) Post-operative complications were wound infection (n=3), leakage (n=2). There was no difference between two groups in operation time, intra-operative bleeding, retrieved lymph nodes and post-operative complication in BMI and VFA. VFA could be a better predictive factor for post operative complication and surgical difficulty than BMI in laparoscopic-assisted surgery for colon cancer.